At Benson, we have the pleasure of working with the Steering Committee and managing the DTC Wine Symposium, the annual summit that raises funds for Free the Grapes!, the industry coalition that has helped open states and replace onerous regulations. In its 11th year, the Symposium attracted another sold-out group of wine club, tasting room, marketing and DTC managers from 19 states and four countries. Along with speakers, volunteers from Sonoma State (thank you! ), and sponsors, nearly 500 execs packed the Hilton Concord hotel for a 2-day program of 5 keynotes, 7 sponsor sessions, 7 workshop sessions and 4 Town Hall sessions (whew!). Great Feedback. In our post-event survey, 105 respondents gave high marks. Ninety-six percent recommend the summit, and 86% said the conference was either “excellent” or “good.” Many people said it was the best DTCWS yet. Astra Digital even blogged about it. Importantly, we also received great suggestions for improvement. The beauty of the DTCWS is that it is a “big tent” for the industry to learn what’s new and next, and to network with peers, vendors and experts. Constant improvements, and a rigorous speaker vetting process, helps propel the DTCWS and helps the whole industry build the $2.6 billion sales channel. Thought Leadership. This year we repeated the popular Town Hall-style discussion sessions, which put up some huge, positive numbers in our survey. For keynotes, we brought in one of the leading thinkers on design and AI, IOT and mixed reality, Phil van Allen, professor at Art Center College of Design. From inside the industry, we had a legislative update by Wine Institute’s Steve Gross (bottom line: rigorous compliance is key). Larry Cormier, GM at Sovos, gave us a sneak peek of the Sovos/Wines&Vines 2017 DTC report. Bottom line: YOY volume and value increased 15%+. So Where does the Money Go? The summit is presented by and a fundraiser for Free the Grapes!, a client of Benson Marketing Group. 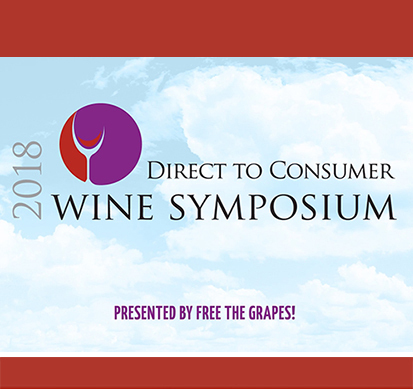 While wineries, Wine Institute and Napa Valley Vintners contribute generously to Free the Grapes!, the vast majority of funding comes from the DTCWS. We then execute a state-specific campaign including hiring local PR agencies (e.g., NJ, AZ), creating and advertising in social channels, writing email campaigns, and an app that allows consumers to send personalized messages to their state legislators. In the first five weeks of 2018, we’ve worked in MS, AL, IN, DE and NJ, generating numerous press placements and 1,374 letters to state legislators. How about 2019? Soon, we will announce the dates and location for the 12th summit. In spring, we will bring the Steering Committee back together to plan how 2019 can be even better! If you’re interested in serving on the S.C., email us at dtcwinesymposium@gmail.com. If you are interested in speaking—and are willing to share detailed case studies and participate in mandatory rehearsals—we want to hear from you, especially if you have not had a chance to share your expertise at other industry conferences. (We like to shake things up.) But wait till the S.C. publishes a Request for Proposal in summer 2019. We’ll keep you updated as long as you sign-up for the Free the Grapes! email list.